The International Federation of Journalists (ISJ) and the European Federation of Journalists (EFJ) condemned on Wednesday the killing of journalist Pavel Sheremet who died in a car bomb attack in Kiev. 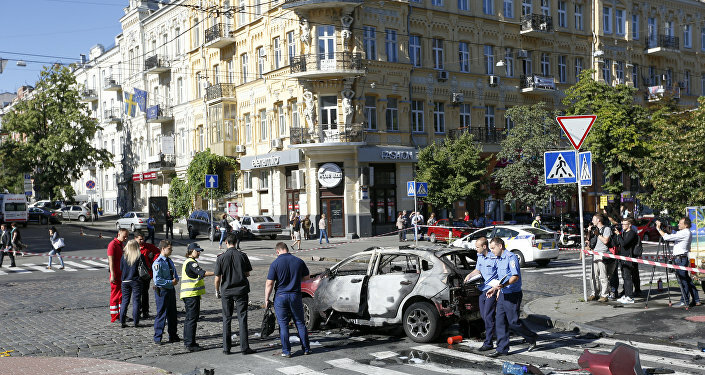 MOSCOW (Sputnik) — Earlier in the day, Sheremet was killed when the car he was traveling in blew up in the Ukrainian capital. According to the Ukrainian Interior Ministry, the explosion was caused by a remote-controlled explosive device. Ukrainian President Petro Poroshenko ordered investigators to ensure the perpetrators are brought to justice. "This is a contemptible murder. The authorities must now act swiftly and efficiently to bring the killers to justice. There can be no more impunity for the killing of journalists. Our thoughts go out to the family and friends of Pavel and to all journalists in the region," IFJ President Philippe Leruth said in a statement on the EFJ website. He said that the ISJ would do its utmost to ensure that Sheremet's murder did not go unpunished. In turn, EFJ President Mogens Blicher Bjerregaerd said that Sheremet's murder reminded the international community that the security situation for journalists in Ukraine was "still a major concern." "We call on Ukrainian authorities to guarantee freedom of expression and of the press in the country," he was quoted as saying by the EFJ. Sheremet, born in Belarus, was a well-known journalist who had worked in Russia, Belarus and Ukraine. He had worked in Kiev for the last five years for the Ukrayinska Pravda news portal and Radio Vesti broadcaster.